Who Can Do Any Good? by Gordon H. Cook, Jr. I finally had to count them. 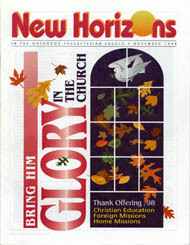 By late summer, the staff of the Committee on Home Missions and Church Extension had lost track of how many churches had been planted during 1998. There seemed to be a problem. None of us could hold in our memory the number or the locations of all the churches we had helped to start since the year began. In previous years, it had been easier to remember them. But for some reason this year, it was different. I was reading Scripture to a person who was unable to respond in any way, and praying that God would gently wake her from sleep. When hospital staff entered the room, they looked at me as if to say, "What can you do for her?" How do you comfort a person in a coma?